Lung disease, such as pulmonary fibrosis, is widely prevalent with no effective cure. Therapeutic approaches to lung fibrosis are challenging owing to lack of effective experimental models for either mechanistic studies or for drug screening purposes. The one example often seen in scientific literature is the bleomycin-induced animal model. In this experimental model, pulmonary inflammation is severely involved in the fibrotic pathogenesis which seems to be different from human idiopathic pulmonary fibrosis. Animal models are thus relatively impractical for drug screening. Cell culture systems have been applied for drug screening purpose. However, they do not reflect the complexity of this disease in terms of cell-cell and cell-matrix interactions in a three dimensional alveolar structure. Considering the complexity of fibrogenic process and the high cost of drug development, Bio S&T sought to establish an alternative model incorporating low cost and higher efficiency for drug screening purposes. Bio S&T has successfully established an ex vivo rat lung slice culture (LSC) system which bridges the advantages of in vivo model with the ease of in vitro techniques. Bio S&T has successfully established an ex vivo rat lung slice culture (LSC) system which bridges the advantages of in vivo model with the ease of in vitro techniques. Extensive experiments have shown that the system is highly consistent and stable on induction of collagen formation. Early alveolar fibrotic features can be induced within a much shorter time (days) compared to the animal model. 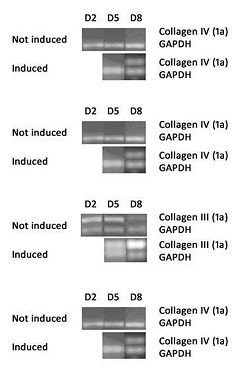 Increasing collagen content in the lung slices can be detected by quantitative analysis of hydroxyproline (see Chart 1). Expression of fibrosis-related genes expression can also be observed via PCR (see Figure 1). Figure 1. 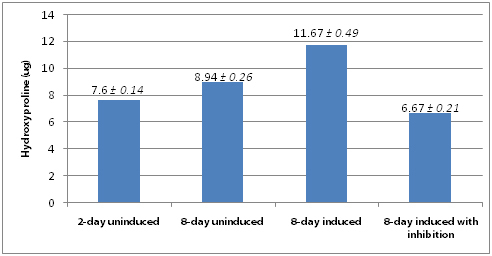 Expression of fibrosis-related genes in non-induced and induced cultured lung slices (days 2, 5 and 8 shown). The LSC platform is powerful in that it allows for compound screening with the relevant and appropriate controls in a sequential manner, with the concomitant opportunity to conduct tissue morphology analyses. All these attributes make LSC the best choice available for effective compound screening in relation to control of pulmonary fibrosis.